It is now up to you to choose the best photo of the year. Similar to our Best of 2009 and Best of 2010 contests, we are asking for your assistance in helping us pick the very best vintage car racing picture from 2011. We narrowed down the thousands of photographs to the following 40 images, chosen solely upon the number of times they were viewed by readers throughout 2011. Please vote by leaving a comment with your favorite image. Write-in candidates: if we didn’t include your favorite picture, share a link of what you think was best. We’ll announce the winner in the January 26th edition of our newsletter and in the comment section. Win Your Favorite Photo: We are again spicing things up this year, as we will randomly choose THREE winners among the comments that will receive a large print of their favorite photo. Be sure to include your email address in the comment form so we can reach you. Each and every one wonderful, but for me there are two by Peter Falkner that truly stand out: The E-type with sparks from the underside, and the GT40 with its brake discs aglow. Between the two, from a personal viewpoint, the E-type resonates with me the most, but had it not been for that photo in this presentation I would have chosen the GT40. 1959 Tipo 61 birdcage Maserati ” Limrock in the Rain “. not sure what lap it was but Mitch Eitel was following in his “59 devon and the rain just LET LOOSE…….. a spin ………….no car was damaged other then a scraped corner on the devon as i recall. what would limerock be without rain. someone should write about the racetracks and what they have giving us during the their season… great pictures forza! Mark – – you are too easily impressed by fire 🙂 Yes, the E-type and GT40 are the best two photos, but in my view, the GT40 is #1. The Shelby Cobra lifting its right front is certainly 3rd best of all. To be honest, I just love most of the photos. But having to choose but one as my favorite, I very quickly was left with the race pictures showing cars in the rain (Elva and Birdcage) and those showing my favorite GT cars at the limit (of adhesion, braking, and suspension travel) in Spa. The Birdcage Maserati at Lime Rock came out first in the first group, the E-type at Eau Rouge did in the second one (where I preferred the Cobra to the GT-40). What I love about the Lime Rock picture is that it evokes road racing at its best, namely on a racetrack embedded in a natural landscape. The E-type at Spa, on the other hand, evokes all the drama and strain on cars and drivers of a 24-hour race which, on top of it , was also held on a beautifully embedded traditional road course. The BMW CSL and Maserati 250F on the first page look like vintage shots. The Shadow Can-Am on page two looks like glass it’s so clear. I want to be the driver of the Alfa Romeo 8C on page three. All wonderful photos. But for my vote, I choose Tim Scott’s photo of the Porsche 718 RSK. Perfect light, perfect motion and perfect car = Best shot of 2011, in my book at least. 1955 Jaguar XK140 during the Zoute Grand Prix rally. (photo credit: Dirk de Jager) has a beautiful and timeless quality to it and gets my vote. Very realistic representation of a F1 car and of the event. Lots of good ones but my favorite is Tim Scott’s shot of the Napier Bentley. Everything is good about this photo. The photo in the rain of Bob Engberg’s Elva is stunning!! *even though it’s not a 1969. Too bad that nobody take look at the pictures of Jonny Bens weren’t, he has some phenomenal shots of the Spa Six Hours. If I have to choose it will be the 1969 Gulf Wyer Porsche 917K driven by Chris MacAllister at Rennsport Reunion IV by Jackie Buys. The photo of the Elva and Porsche at Infineon is a classic picture showing true competitive spirit. I love the possibilities in this photo. It gets my mind racing like no other. I love Bobs Elva racing in the rain! You can feel the speed …..vivid colors and you can see the wet spray as well as a good looking car. My vote goes to the image I wish I had taken. Have to go with 1974 Porsche 911 RSR driven by Dennis Singleton at Rennsport Reunion IV. (photo credit: Jackie Buys) because the lady can pan. My vote goes to Jackie Buys, 1969 Gulf Wyer Porsche 917K driven by Chris MacAllister at Rennsport Reunion IV. Sche is doing a great job! i vote to “Maserati 250F at famed La Source hairpin during Spa Six Hours race”. The picture with the 917K by Jackie Buys. @ Glenn Davison: you have an excellent turn-of-phrase, writing in a manner I love to read when the topic is cars. Thanks Glenn for reading my image of Andrew Barton in his T37A. A picture might be worth a thousand words, it still takes someone to read the picture. Thanks. Dennis, Thanks for the compliment it’s appreciated. Your bottler of a photo said it all. I just translated. It must be fulfilling to capture a magic moment like that. Congratulations. The 1955 Jaguar XK 140 along the avenue of trees is wonderful but the three 250 F Masarati’s following a Lotus make it for me. The Martini & Rossi 917 couldn’t have been parked and staged any better, and I think it’s the best pic from the best vintage event of the year. I think the 1969 Gulf Wyer Porsche 917k coming down the hill on a turn looks great. This photo exemplifies the enthusiasm and energy shown by the owners and drivers of historic racing automobiles in whatever weather that is available: a beautiful moment. 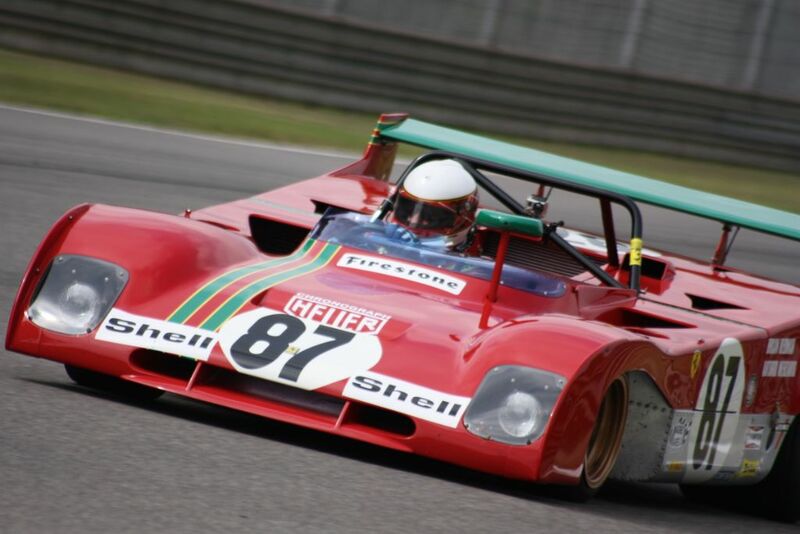 I really enjoyed David Ferguson’s photo of the Ferrari 312 at Barber Motorsports Park. It reminded me of the car Mario Andretti won with at the 1972 Daytona Continental 6-hour race; and which I almost hit from behind with my 1963 Corvette! P.S. I finished 2nd in GTO. I agree Phil with your selection of the best photo. However, as you well remember, you almost booted Mario from his win at Daytona in 1972 because you were driving with no “bloody” brakes. It is a miracle you took the checkered flag and a second in class. Imagine your place in automotive history today if you had demolished his car. Yes, I realized afterward that it wasn’t the best idea to be racing with NO brakes, but I was young, and determined to finish my first long-distance race! So many good ones….but as a lifelong GT40 fan, the Falkner photo of the GT40 with the brakes glowing is the best one. I also like the start of the RAC Tourist Trophy Race at Goodwood, with the two AC Cobras in the front row, and the Daytona coupe as well. Very well done. AND… the photo of the Alfa 8C2900 driving through the countryside, with the driver who looks like Ralph Lauren (and might BE Ralph Lauren?) and the stunning girl in the left seat…also a great vintage race car photo. Oh my, that’s a very hard pick. All of them are simply fantastic, pure emotion. As this is all about racing, I have excluded those photos that are really charming, full of romantic athmosphere, but not as dramatic in terms of action. So, no Alfa 6c parade, no Bugattis’ Spanish reunion :-). At the end of the day, the one that made me speechless and breathless was the picture of the AC Cobra “emerging from the shadow”, almost drifting. That’s my choice. I am really sorry for the photo at the Goodwood TT start, that would be my (close) second pick. Thanks to all of you for sharing these pieces of art! I love the 1974 Porsche 911 RSR, she goes like a dream behind the branches, and green is the color of Hope. I have one 911 twenty years older and I love her too. Yes “she”, I think for those who have that much personality they deserve “she”. 1959 Maserati T61 Birdcage of Anthony Wang has it all, the car the motion, the colors and the sense of speed. Great photo. Thanks for all of them. AC Cobra emerges from the shadows during Spa Six Hours. (photo credit: Jurrie Vanhalle) – isn’t this what Cobras are for? 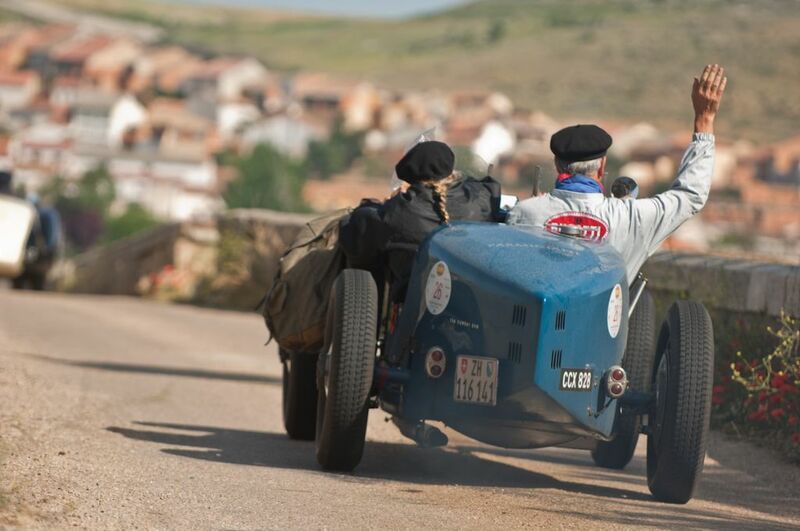 The couple in the 1926 Bugatti Type 34A at the International Meeting in Spain says it all if you enjoy your sports or racing car out on the road . Dirk de jager has caught the atmosphere of the moment perfectly. Two strike my fancy. The Jag and the GT-40 at night.. The Tim Scott photo at the Start of the RAC Tourist Trophy race at the Goodwood Revival took the truth meaning of being an autoenthusiast. Just look the expression in the faces of the fans, hearts beating at 7,000 rpm. Just great snapshot, took the souls out. my fafourite car on my favorite track . best pic Maserati 250F at famed La Source hairpin during Spa Six Hours race. 1974 Shadow DN4 Can-Am of Rudy Junco during the Monterey Pre-Reunion. It’s a nicely composed shot of my favorite Can-Am car. Tony Southgate designed a car that was both competitive and beautiful. And all the while the team was developing the technology to run that new unleaded fuel! Wow, what a treasure trove of classics! My favorite wold have to be the Ford GT40 at Spa. It’s the closest I will ever get to sensing the glory days of sports car racing in the sixties. Beautiful works of art, all. but the BMW took the prize for me. The light coming onto the driver was special. I remember the history of the Shelby Cobra roadsters and the thrilling 1965 world championship manufacturers trophy in 1965 when the Daytona Coupe designed by Peter Brock took the long standing series from Ferrari and fulfilled Carroll Shelby’s dream and comment when in1964 Shelby said “next year Ferrari’s a#% is mine”. It was! Lots of great shots, but I’ve always thought the Porsche 917 was one of the greatest race cars of all time so my vote is for the ’69 Gulf Wyer 917 at the Rennsport Reunion by Jackie Buys. The Napier Bentley coming off the line at the hillclimb. I can’t imagine piloting this beast. 2nd choice: Chaparral “sucker” car at Goodwood. Must have caused a real ruckus for the spectators. I Choose Martini and Rossi Porsche 917K at top of Laguna Seca’s corkscrew for Rennsport Reunion IV. (Photo credit: Dennis Gray) because I love the 917, the location is unmistakable, and it looks like suspended animation just like how we feel about all these racecars. Gulf Porsche 917 gets my vote but they are all amazing! The 718 RSK in the sun has my vote as Best! The Ferrari 250 GTO is, to me, the most beautiful car Ferrari ever built!! So many great photos, but I’d have to vote for the Jag XK140 on the Zoute Grand Prix Rally by Dirk de Jager. Would look good in black and white as well! That shot of the GT40 with its front discs glowing red-hot gives me the goosebumps, as it goes far beyond nostalgic eyewash to capture a true American challenger being driven as intended, i.e., at the limit. The 1971 Porsche 917K Martini of Greg Galdi at RRIV is my favorite, though I also artistically like the technical execution of the Maserati 250F at La Source at Spa. #1, Ford Capri during the East Africa Classic Rally. Showing excitement, toughness and endurance. #2, Ford GT40 glowing brakes during Spa 6 hours. Having seen this type of action many times. It shows the Magnificence of the Modern Machine in action. #3, Couple in Bugatti in Spain leaving the parade and of into the sunset with their prize in the bag hanging onto the side of the engine cover. Have to go with the photo of Bob Engberg in his Elva at Sears Point. Tough place to race in the dry, let alone the rain. My vote goes for “The 1955 Jaguar XK140 during the Zoute Grand Prix rally” photo by Dirk de Jager. The composition is outstanding. I vote for this photo, its a tough shot, up close, speed, focus and timing all came together for a great shot. I vote for the “1969 Gulf Wyer Porsche 917K driven by Chris MacAllister at Rennsport Reunion IV. 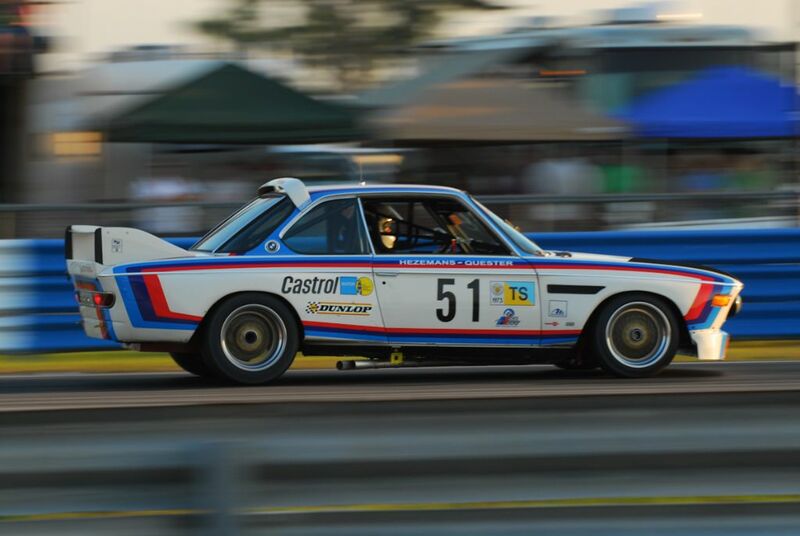 (photo credit: Jackie Buys)” Great race car, great event, best of both worlds! Well, it came down to the Maser in the rain, or Dennis Gray’s shot of the 917. Have to go with the 917. It captures an iconic car at an iconic event in one frame. A beautifully composed shot. My vote goes to the E type with sparks underneath and headlights ablaze – atmospheric and just looking fast! 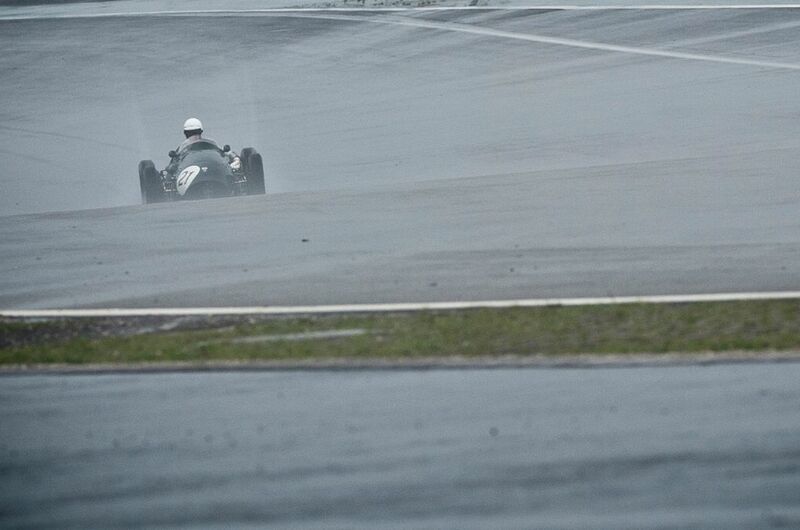 The Maserati 250F in the rain is the most beautiful, together with the Ferrari 126C2. I also like the Daytona racing in the mountains, awesome, and the silver GTO (3909GT) in Wyoming. All photos are amazing, but these are the best. I will have to go with the Porsche 718 RSK. This car started racing in races I started watching in the ’50’s and it just has the exact shape of a sports racing car. (My thoughts!) Thanks for all the wonderful pictures. If there were one shot I would want on my wall it would be the ex-Roy Salvadori Maserati 250F at the Modena Track Days. My vote is the Maserati 250F at La Source. It evokes the feelings of 1950’s Grand Prix racing at its purest form. Long before all the wings. Just a pure race car at speed. What else is there to say? My vote goes to the Tim Scott picture of the Ferrari 412P leading the 512M at Silverstone. Apart from the shot being technically perfect, I think it captures the excitement, competitiveness and frustration of Motor Sport. Wow. So many fantastic shots. My choice was initially “1955 Jaguar XK140 during the Zoute Grand Prix rally” (I have a bias towards Jags, plus the shot is so nicely framed) but if I wanted something that I would love to see on my wall, it would instead be “Jaguar E-Type Lightweight bottoms at Spa’s Eau Rouge during Six Hours”. My vote- Tim Scott’s Porsche 718. The giant killer casting a larger shadow than it’s real size. These are great photos, but like Rick says, if I choose the one I want on my office wall it is Julien Mahiels Daytona at the Modena track days. Mine is the Cobra coming out of the shadows. Looks period without too much of a current race track “safety” stuff. The Maserati 250 F going into the turn at the La Source hairpin at Spa. “Classic design” in a wonderful photograph that gives a sense of speed. 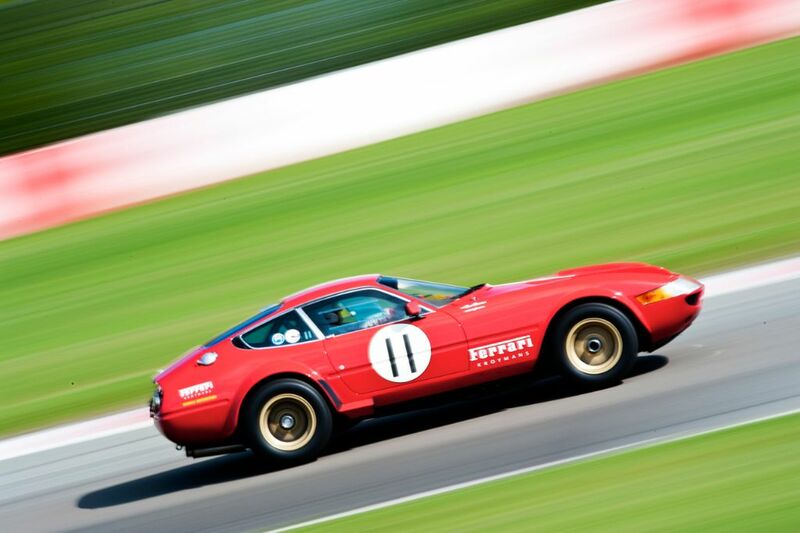 I’ll pick Tim Scott’s photo of the Ferrari 275 GTB/C at the Silverstone Classic. A perfect pan shot with a crisp, full frame image of the sensuous car contrasting with the blurred red and white curbing and armco which not only frame the Ferrari, but also suggest the speed it is traveling. The 275 was probably one of the last dual purpose cars which could be driven on the street yet still acquit itself well on the track. A perfect cover photo for a vintage calendar. Although all of the photos chosen have their own beautiful merit, I’ll have to go with Peter Falkner’s photo of the GT40 at Spa. A magical shot. Mitch. Many fantastic shots. My favorite cars in these were, of course, the 917K (I’m a big Porsche fan), the 60’s Lotus F1 car, and I have to give “props” to the driver lighting up the tires on the old Napier/Bentley! Favorite photo, however, for me is the GT40 at night. If any of you get the opportunity to go to the Monterey Historics, take it! Fantastic event. Got to love the Faulkner photos, with my choice being the GT-40 at night, brakes glowing! Great composition and lighting and the subject is just perfect. Sharp focus, great composition with the banner in the background, lovely angle and one of the greatest sports racing cars of all time! It has a period AERO ENGINE! Historic racing at its best! The photo of the RSK Porsche by Tim Scott is my choice. Having at one time owned 718-032 (I think it ended up with Ralph Lauren) back when regular people could afford them, I am more than a little biased. The best photo is: Ford GT 40 in Spa 6 hours and the 2nd is the Jaguar Lightweight in the same event. You can see the lights, water, speed and dificulty for the driver on them. There are many fine photos in this years collection, but for me it finally came down to a choice between Michael DiPleco’s T61 at Lime Rock and Peter Falkner’s GT40 at the Spa, with my final selection being Mr. Falkner’s photo. The play of the head and tail lamps on the pavement, the captured glow of the disks with sensation of speed make this an outstanding picture. So many choices – I’d have to go with the Jag XK 140 @ the Zoute Grand Prix – great composition – with a close second to the amazing Chaparral 2J @ Goodwood! So hard. Jurrie Vanhalle’s photo of the Cobra at Spa best captures the essence of historical racing for me. Another year of fantastic images from which the selection of one is tough to make. #6 The Porsche 904 at Portland. My choice is Dennis Gray’s Porsche 917 at the top of Laguna Seca corkscrew, with the Rennsport sign behind it. 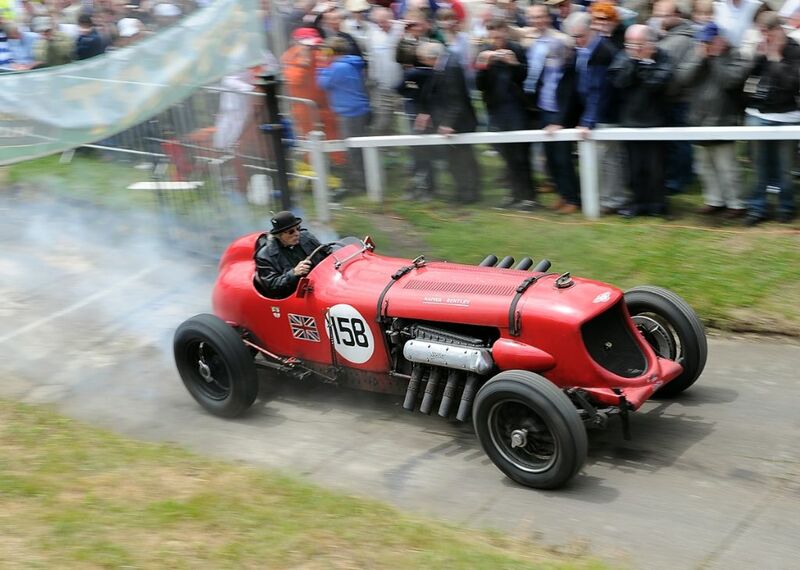 3) Dirk de Jager”S pix of the 1936 Alfa 8C900 Boticella @ the Alfa rally. My vote goes for the 51 Ferrari 212 Export Barchetta at the Gstaad Classic rally. (photo credit: Julien Mahiels) – the sense of speed is just beautifully conveyed. How could you not love a “birdcage”? It´s real great drive a old car and specialy crossing this beautifull country . That is the reason, my favorite is the rouming through Wyoming in a Ferrari 250 GTO during ” the Colorado Grand Rally ” , my best wishes to Forrest & Ashley Mozart. The Ford GT 40 with glowing brake disks is the champion. Takes speed to make that color/smell/sound/feel. 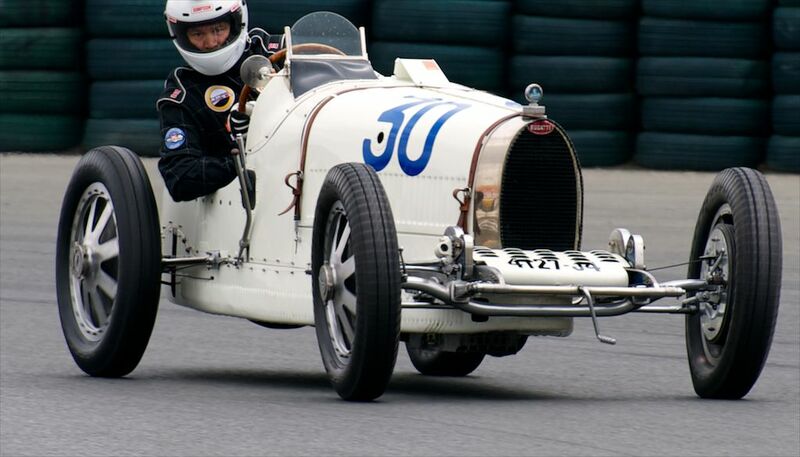 Dennis Gray’s photo of the 1927 Bugatti T37A fully tells the story: vintage….racing. Of course, your vintage may vary. A Birdcage “Singing in the Rain”! The 1959 Maserati T61 Birdcage of Anthony Wang during the Lime Rock Historics and photographed by Michael DiPleco is my favorite vintage racing picture for 2011. It shows the beautiful form body and water can make when mixed gingerly. Jackie Buys gives us a new and fresh eye and her talent is reflected in her superb photography. My vote is for both her photos; the 917 photo is as powerful as the car she shoots and her shot thru the leaves of the RSR is inspiring and exciting. You rocked the Rennsport Miss J.
It’s almost always a real effort to try to select my favorite Ferrari image and I always find Dennis Gray’s work super! However, the image of the crew of the Bugatti T34A in Spain taken by Dirk de Jager just grabs my heart. Such joy in motoring. My vote for best photo for 2011 is the start of the Rac Tourist Trophy at the Goodwood Revival. just look at all the action in the photo. Kinda makes a person want to get out their and run some laps or at least be in the viewing areas. The Ferrari 275 GTB during the Gstaad Classic rally. (photo credit: Julien Mahiels). is my pick followed very closely by Dirk de Jager- The crew of this 1926 Bugatti T34A enjoys the International Bugatti Meeting in Spain. And Dennis Gray’s Martini and Rossi Porsche 917K at top of Laguna Seca’s corkscrew for Rennsport Reunion IV. My two favorites are the Shadow DN4 and the Lotus 49. Both nicely composed. 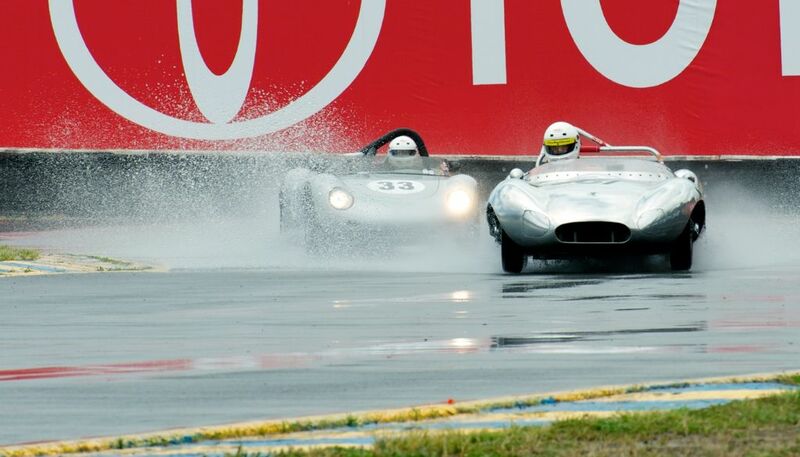 I really like the shot of Robert Engberg driving his Elva in the rain. It shows a potentially faster Porche spyder in the mist and spray behind. I wonder if the Porsche is catching or losing to the smaller Elva. Great shots. Julien Mahiels picture of the Ferrari 126C2 at Modena Track Days is my pick. I think the Bugatti meet in Spain strikes the exactly right tone for enthusiasts. Additionally, there are so many great Ferrari and Maserati photos in this wonderful group. My vote goes to Dennis Gray’s photo of the Bugatti T37A. It really shows some attitude – both the car and the driver. Look at those front wheels and the driver’s eyes… WOW! That’s what vintage racing is all about. So many choices…..dying of hunger looking at the menu in the restaurant. #2 ford gt 40 nighttime with glowing brakes. My vote goes to Bob Engberg in the Ellva at Sears Point.. Real Racing in the Rain! The 1936 Bugatti in Spain – what a great car, setting and perspective. Overall, a really outstanding group of photos! I would say the GT40 is my favorite. The evening light and glowing brakes truly capture the color, excitement, and mood of endurance racing. All of that plus the classic lines of the GT40 creates an epic photo. Best: Maserati Birdcage in the rain at Lime Rock. Can I see the other 960? Too much is never enough but these 40 are exquisite. For pure visual impact (personal marque preferences aside) it is a hard choice between the Porsche 718 RSK by Tim Scott and the Maserati T61 Birdcage by Michael DiPleco. I love the composition of picture of the Porsche 718; the sunlight glistening off the body, its shape well frame. But the colors in the picture of the Maserati are so vibrant. I can almost feel the roostertail off the car in the rain. It just feels like he is going all out. That’s the one I would love to have on my wall. My #1 vote has to go to the Ferrari pair from Silverstone: the 412P and the 512M. The colors of the two cars with the red and white paint of the shoulder make this a classic photo for me, although I really love the Porsche 904/6 at Portland as that is one of my all-time favorite cars, and that almost was enough to earn my vote. My choice: the period picture of the 1936 Alfa Romeo 8C 2900 Boticella during the Alfa 8C Rally, apparently running through Italian vineyards. Just a beautiful shot of a beautiful car! This photo: Maserati 250F at famed La Source hairpin during Spa Six Hours race. (photo credit: Jurrie Vanhalle) Could have been just as easily been taken back in the ’50s. I love the way it captures the beautiful Maserati and the hairpin at SPA. Very hard decision!!! Very tough to pick a favorite. I think my pick would be the picture of the Gulf 917 descending the Corkscrew. The GT40 at Spa is a close second. 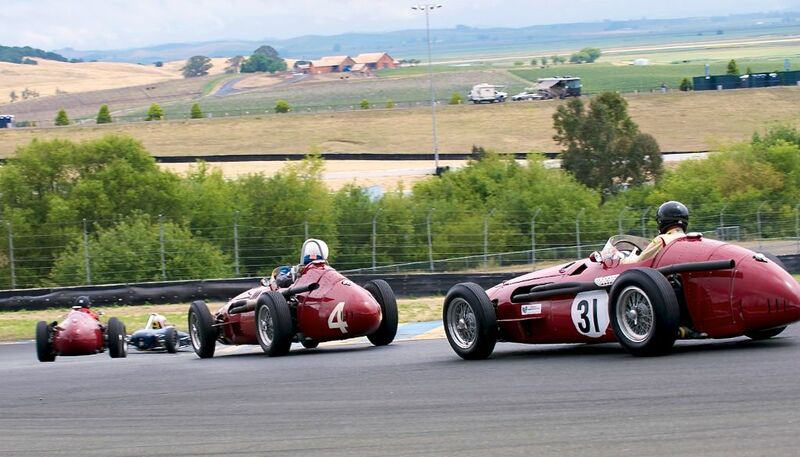 Just how evocative is Dennis Gray’s photo of the three 250F Maseratis & Lotus at the Sanoma Historics! With the fields of farmland & the distant open hills as the backdrop this shot epitomises the 1950s era of motor racing. It’s a hard choice, as always, but I like Michael DiPleco’s photo of the ’59 Maserati Birdcage in the rain at Lime Rock. I also like Tim Scott’s capture of the Porsche 718 RSK. and Peter Falkner’s shot of the lightweight E-type. I think I will stop there, before I end up listing all 40 pictures. Many, many great photos here. Falkner’s study of the GT40 with glowing brakes at SPA is my choice. Simply beautiful! 1959 Tipo 61 birdcage Maserati ” Limrock in the Rain “ I just saw one, up-close for the first time, at an event at the Arizona Biltmore this past week. What an amazing car. Not easy and subject to change at any moment…all are so special. Many thanks to all for your kind words about my images. I’ll be at Classic Le Mans this year to try for more! 1) 1955 Jaguar XK140 during the Zoute Grand Prix rally. (photo credit: Dirk de Jager) because it’s a very good picture. 3) The UOP Shadow. As an image I don’t think it’s as good as my 1) 2) picks but I saw that car race any number of times and I find I still have a soft spot for it. “Best Photo”? Only one??? Impossible! The would be Dirk de Jager’s “1955 Jaguar XK140 during the Zoute Grand Prix rally”. Beautiful composition, warm late afternoon sunlight casting long shadows through the stately trees along the boulevard, svelte XK Jaguar, crisp in the foreground, with more emerging from the mist all the way back to the vanishing point. What an iconic moment, captured perfectly! My compliments to Dirk de Jager — I wish I’d been there, his photo takes me there! I choose the picture showing the three Maserati 250s chasing the Lotus. This picture has everyrthing: the beautiful surroundings of the circuit; the feeling of setting up for, and rounding, the corner; and (best of all) a Lotus showing them all the way to go! Amost as good is the one showing Bob Engberg’s battle in the rain. I love the photo of the two men in the Bugatti seen from the back. They are participating in a Bugatti Festival in Spain. The photo shows two people who are having a great time and there doesn’t seem to be any pressure on them. Must be after everything was over. Tim Scott’s Silverstone shot of the FERRARI 275GTB is fantastic and cetainly showcases vintage racing but my overall favorite has to be Dennis Gray’s shot of the 3 250F MASERATI , UNREAL! Even though Peter was last. 1969 Gulf Wyer Porsche 917K driven by Chris MacAllister at Rennsport Reunion IV. Nearly perfect framing, and love the giant sign in the background. Loved em all. The Cobra emerging at SPA (Vanhalle) with the right front tire just inside the verge is the best “Hammer down” shot. He needs just a little more reverse lock to catch the tail as he rips up the asphalt ! From a photographers point of view some of these pictures are perfect, but my vote goes for the three chasing the Lotus, all the fury of the chase against a very pastoral background. Unfortunately I have no appreciation for fuzzy, out of focus blurred “action” photos. We photographers select the best from the proof sheet which indicates the camera is the artist not the photographer when it comes to framing and composition. The junior college photography teacher is wrong. Shooting historics is difficult because we are trying to capture the beauty of another age yet somehow we accept the ridiculous combination of modern crash helmet and classic car. My first choice (Julien Mahiels shot of the tarmac-rally Ferrari Daytona Competition) was mentioned only once in all of the above. 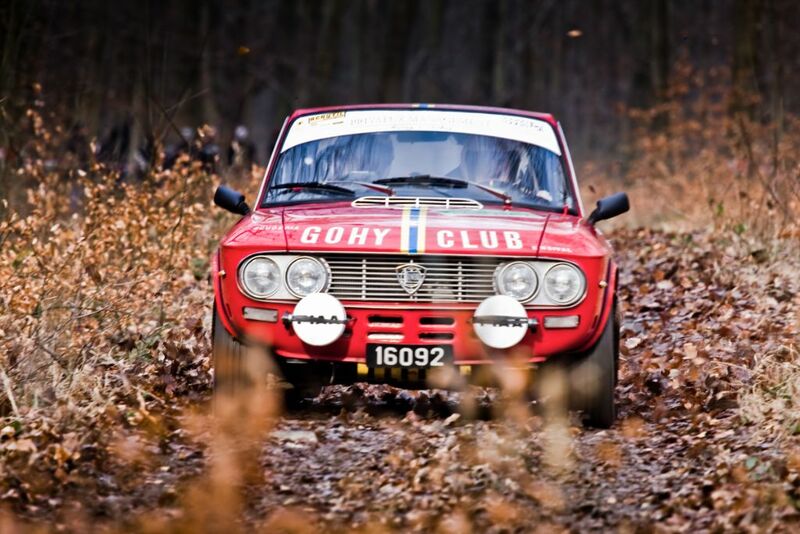 Perhaps all three speak to me…..tarmac rally, front-engined Ferraris, and Julien Mahiels work. A bunch more were in the running for me, but winnowing it down to just two others…… E-Type twilight Eau Rouge, and Martini and Rossi 917 at Corkscrew.